WHETHER YOU’RE looking for clients, investors or employees, you need to know how to pitch your products, services and ideas. 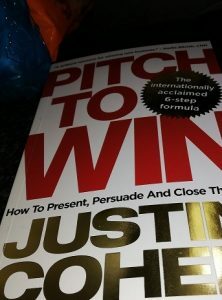 Author Justin Cohen’s internationally acclaimed 6-step formula has been credited with credited with winning some of the toughest deals and exponentially increasing sales. 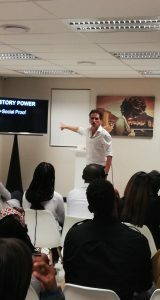 Presenting the 6-formula steps on how to win a pitch, Justin Cohen, author of the book Pitch to Win, at the launch last night in Sandton. All images SLM. His book titled ‘Pitch To Win’ was launched last night in Sandton, that saw attendants drawn from legal to business people, including members of the ‘fourth estate’. -How to win without being salesy and by living your purpose. Speaking to this reporter, Justin says the book is targeted at entrepreneurs and business minded market. The tall and well traveled author is an international speaker, trainer armed with post graduate degree in Psychology. He has coached businesses including SMMEs and major corporate organizations. Asked if the new minister of finance Tito Mboweni and Pres Cyril Matamela Ramaphosa, would be keen to own the book, he gave a approving smile and asserted “why not, the two are well informed and boast thick business acumen. Preparing for that multi-million dollar pitch get this book, its worth every Yen. This should be their point of reference”, said Justin, who spoke highly of ex- finance minister Nhlanhla Nene. The book also got a nod from top business owners and strategists. Got a pitch to prepare for, look no further than ‘Pitch to Win‘.